The Christchurch mosque massacre gunman donated cash to a far-right movement in Austria, it has been revealed. Austrian Chancellor Sebastian Kurz disclosed the link between the killer and the hardline Identitarian Movement - and said the country was looking into banning the extremists. "We can now confirm that there was financial support and so a link between the New Zealand attacker and the Identitarian Movement in Austria," Mr Kurz said. Hansjoerg Bacher, the spokesman for prosecutors in Graz, said Martin Sellner, head of the Identitarian Movement - which says it wants to preserve Europe's identity - received €1,500 in early 2018 from a donor with the same name as the man accused of the Christchurch atrocity. He added an investigation was under way into whether there were criminally relevant links between Mr Sellner and the mosque attacker. Prosecutors say they stumbled across the donation as part of a probe against Mr Sellner in connection with possible financial offences. Mr Sellner published a video on YouTube in which he confirmed the donation and said police had raided his house over the possible links to the Christchurch attacker. In the video, he said: "I'm not a member of a terrorist organisation. I have nothing to do with this man, other than that I passively received a donation from him." Mr Sellner said police searched his apartment on Monday and seized electronic devices after he received a "disproportionately high donation" from a person named Tarrant. Australian Brenton Tarrant (28) is in custody charged with murder over the mosque attacks, in which 50 people died. However, Mr Kurz said that Austria was looking into the possibility of dissolving the Identitarian Movement. On Tuesday, Mr Kurz said on Twitter that the connection between the Christchurch attacker and members of the Identitarian Movement in Austria needed to be fully clarified. The Austria Press Agency reported that the chancellor said after a Cabinet meeting that there can be "no tolerance for dangerous ideologies, wherever they come from". He added that Austria will apply the "full force of the law". 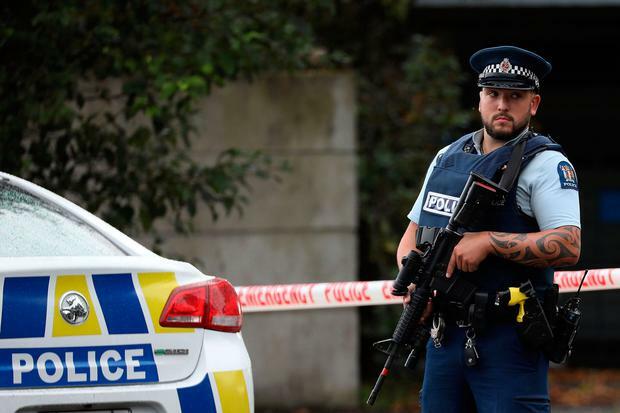 Meanwhile New Zealand police launched a "high-priority" investigation yesterday to find out whether a man who died after an early morning standoff with officers had links to the mosque attack, in which 50 men, women and children were killed. Officers stopped the man in his car just outside Christchurch and began negotiations that lasted for about three hours. Police eventually approached the vehicle and found the man critically injured with a stab wound. "A high priority investigation is under way to determine whether or not the deceased man posed a threat to the community," said Mr Bush. In a separate development in Austria yesterday, authorities said that they have arrested an Iraqi man suspected of carrying out unsuccessful attacks on trains in neighbouring Germany last year and sympathizing with the Islamic State group. The 42-year-old was arrested on Monday in Vienna, where he lives. Vienna prosecutors yesterday said he is suspected of "carrying out terrorist attacks on railway lines in Germany in October and December 2018".